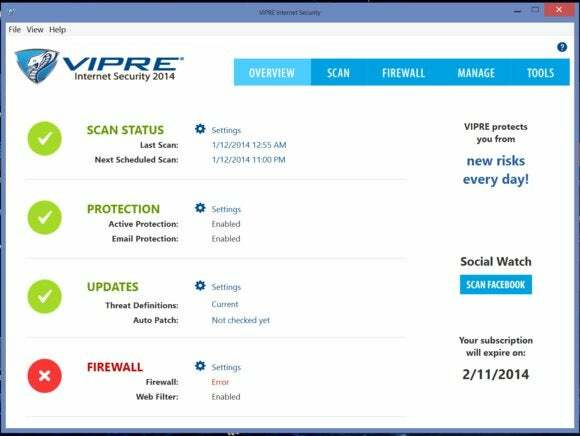 The name Vipre Internet Security 2014 sounds impressive. But this security suite ($50 for two years of protection on one PC) offers merely adequate protection, and its interface needs a makeover. In our real-world (zero-day) tests, Vipre blocked 87 percent of unknown malware attacks, compared to 98 percent or better for most other products (only Webroot SecureAnywhere Internet Security Complete fared worse than Vipre on this measure). 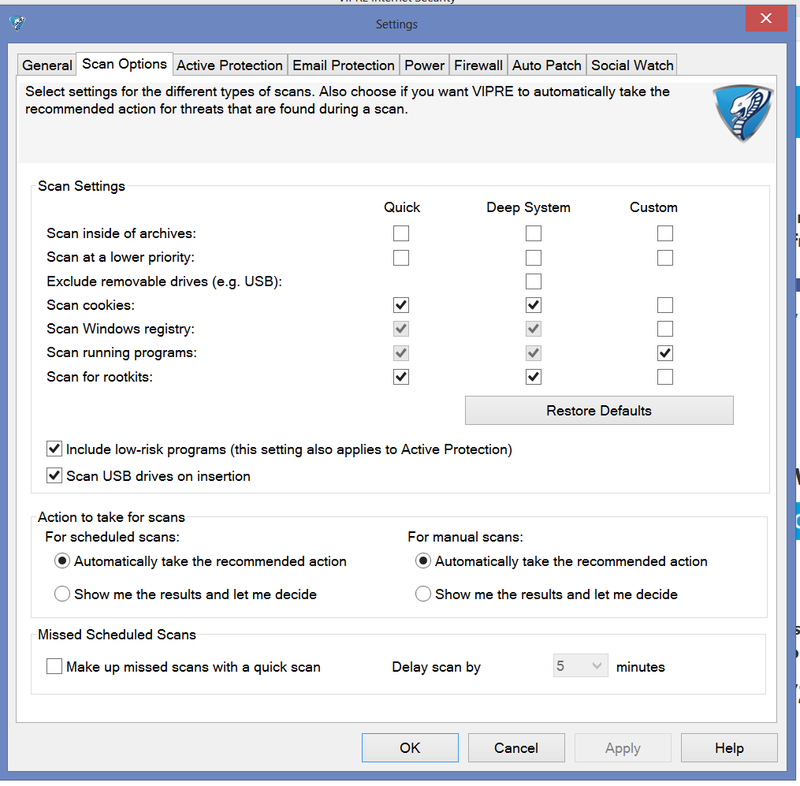 Vipre performed extremely well against known malware attacks, however, successfully blocking 100 percent of them. Though Vipre didn’t incorrectly tag any safe websites as threatening, it did flag five legitimate programs as dangerous in our usability tests. Only F-Secure Internet Security 2014, and Webroot SecureAnywhere (again) had as many false positives in our ten-suite roundup. Vipre adds some bulk to your system resources, with a performance score of 7–that’s marginally better than Norton Internet Security 2014 and Eset Smart Security 7, but significantly slower than Kaspersky Internet Security 2014, F-Secure Internet Security 2014, and AVG Internet Security 2014, among others. With Vipre running, you may see some lag in startup and shutdown times. Word links, checkboxes, and radio buttons don't fly in the touchscreen era. Installing Vipre is a quick process, but it does require a system restart. The program identifies incompatible software, such as other antivirus programs, but it doesn’t require that you uninstall them before continuing (though it recommends that you do so). The main console window has Vipre’s logo in the upper left corner, next to five tabs: Overview, Scan, Firewall, Manage, and Tools. The Overview screen shows you your protection level in four status indicators (scan status, protection, updates, and firewall). Each status indicator has a circle with a green checkmark (if you’re protected) or a red x (if you’re not), and a link to that status’s settings menu. The other tabs offer more-advanced features, such as quarantine and scan schedules in the Manage tab, and ‘Social Watch’ and ‘History Cleaner’ in the Tools tab. Though the main buttons and tabs are touchscreen-friendly, most of Vipre’s interface is full of word links, checkboxes, and radio buttons. Vipre’s settings menu needs a lot of work. You can access specific settings (such as settings specific to scanning, or to the firewall) from the main screen, but the menu is confusing, unintuitive, and not at all touch-optimized. The program doesn’t explain terms and features, though you can always click the Help button if you want to slog through VIPRE’s Help literature. Vipre Internet Security 2014 pales next to the competition. The level of protection it offers is just adequate, and its interface lacks polish. Vipre's suite competently guards against known threats, but its zero-day detection was below average in our roundup and its interface lacks polish.